A new online survey lets Metrolink passengers — and potential passengers — provide feedback on improving train stations and making them more convenient and safe. Click here to take the online survey. •The Metrolink tracks are adjacent to the El Monte Station used by Metro and Foothill Transit buses — but the Metrolink station in El Monte is about one mile away. •In the San Fernando Valley, the study looks at improvements to the existing station or moving the station two-thirds of a mile east to Reseda Boulevard. That would improve access for pedestrians, cyclists and transit users — and make the station a 15-minute, three-quarter mile walk from CSUN. Click here to leave a comment. •The current Montebello/Commerce Station for Metrolink is 1.5 miles from The Citadel and Commerce Resort. A new Metrolink station could be within a five-minute walk of the Citadel and be near a potential station under study for the Eastside Gold Line Extension project. 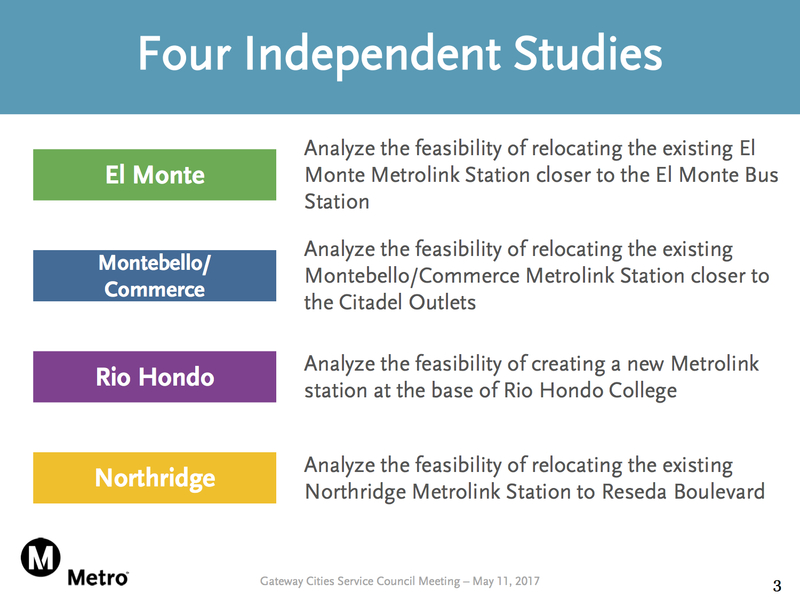 •Rio Hondo College in Whittier has about 20,000 students per semester but it’s seven miles to the closest Metrolink station — the one serving Montebello/Commerce Station. A potential station for the Eastside Gold Line Extension would be about 1.2 miles away from the college. Metro is one of five county agencies which provide funding for Metrolink commuter rail (the others are Orange, Riverside, San Bernardino and Ventura counties). In March 2016, the Metro Board of Directors asked for a study of the station relocations, looking to find a way to improve connections to local transit and boost ridership. Staff have been looking at the issue and have narrowed down locations that may be able to accommodate a Metrolink station. It’s important to note that funding still would need to be secured for any of the three relocations to happen and/or the creation of a new station. The following are presentations given to the Metro Service Councils representing the Gateway Cities (pdf), and San Gabriel Valley (pdf). The presentation for the San Fernando Valley was given to a community meeting last week, which about 90 people attended (scroll down for the station relocation info, pdf). How We Roll, May 9: what is the best transit accessible burger in L.A. County? In my view, if Metrolink is going to succeed in its missions of relieving traffic congestion and reducing air pollution in Southern California, it is imperative it both evolves beyond simply serving commuters and expands the reach of its rail network by opening new routes on the many existing freight railroads in the region and offering dependable, full time service. The region is growing and evolving rapidly, and it is important that our railroad keeps up. New lines (Brea-LAX-South Bay, US-LGB-San Pedro, Santa Barbara-Ventura-Filmore-Santa Clarita, LOSSAC-John Wayne Airport & US-Westminster-North Huntington Beach just to name a few) are all meritous and could be added to the Metrolink network map relatively inexpensively using existing and abandoned freight railroad tracks. Boosting ridership I think would require making most if not all of the lines as effective as the SB line. It seems to run the most frequent. I know this may be an issue with demand for service and also the amount of trains, but personally, I feel that a lot of the service is for those coming into Los Angeles at peak periods. In example, it seems virtually impossible to get into OC after 9 A.M. via Metrolink. If im correct, the last train out of Union is at 6:45. Maybe i’m not keen enough on the transfer point and layovers, but there are times when it is really really difficult to ride that system smoothly. The above improvements would be stellar, but the existing service still seems to have some shortfalls in my opinion. The SB line is likely as effective as it is because Metrolink actually owns the tracks for the most part. I think the goal for Metrolink should be headways of no greater than 60 minutes on all lines from 4 A.M. to Midnight. At least 21 trains (42 including return trips) per day, I believe, would be warranted on ALL Metrolink lines. I think it might be worth looking at integrating the OC Line service with the Surfliner & Coaster services to avoid price discrepancies/redundancy, & other conflicts. More frequent SLO to SD Surfliner service (with TAP/Compass Card acceptance, free local transfers, & increased fare subsidy) would be ideal in the long run. I think it would be way more useful if it was converted to a system like BART in the bay area – I am sure the cost would be high, but I think it would be well worth it! I agree about OCTA there, they have a lot of work to do to catch up with Metro’s dramatic improvement in the past 25 years. I know that Metrolink is working on additional double-tracking in a number of locations, so hopefully this will mean more frequent service & less conflict with freight trains when completed. If all four plans will improve service for the riders, all of them should be done. I welcome all these changes and I’m glad someone is paying attention regarding moving the Montebello/Commerce station closer to where people are actually going. But my only question remains is that: Will there actually be Weekend service on the Both the Riverside County Line and Ventura County Line?? It’s nice that the Citadel will eventually be accessible by Metrolink but how much use will it get if no one can use it on the weekends. I just want to emphasize that at this point these are studies and a survey — no funding has yet been secured for relocating these stations. I am surprised they haven’t relocated the Northridge station already. If I remember correctly, that station was built on DWP land as a post-earthquake emergency measure. The station did not have any mainline bus service (it did for a while and doesn’t anymore.. just DASH). Perhaps a move to Reseda Blvd. would be a good idea. Please electrify the Metrolink system, ideally the Antelope Valley Line and Orange County Line (Lancaster to Palmdale, San Fernando-Union Station-Laguna Niguel/Mission Viejo station), which is a part of High Speed Rail route as well as the San Bernardino Line. By using either EMU or electric/dual mode locomotive, it allows more frequent train services, higher speed in operation, reducing travel time, and eliminating noise pollution and diesel exhaust emissions. I wonder about some of these proposals. On the surface, it seems like a good idea to bring the station closer to the important destinations. But will the new locations have enough parking to accommodate the passengers? El Monte Busway Station has a lot of parking and it would be nice to have a full transit center there. But there does not appear to be much room near the Citadel or near Reseda Blvd. While I agree that some fixed parking is necessary, I think it is a mistake to resign the areas around stations to massive parking structures. Transit oriented housing, dedicated bus transfer facilities and locally owned businesses are a wiser use of adjacent land in the long term because the presence of a pleasant community square (And bus transfer hub) immediately adjacent to stations will do more to increase Metrolink ridership over time, thereby increasing the overall value of the system to the public.